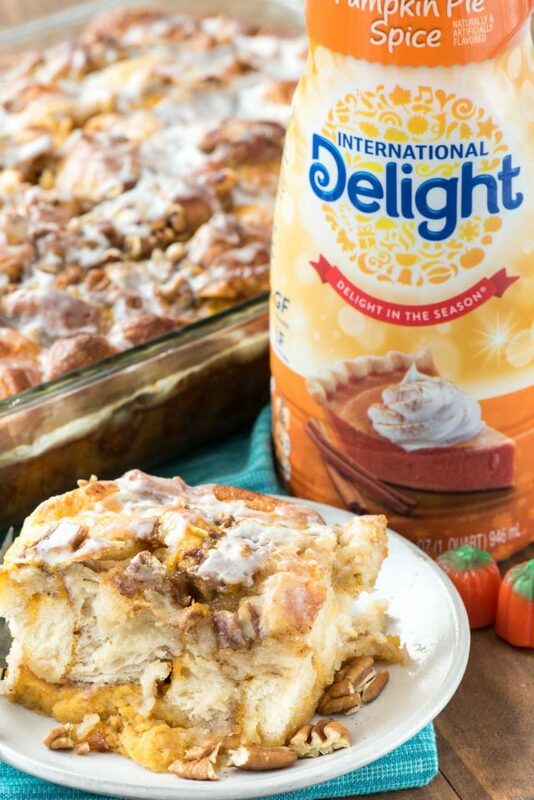 Pumpkin Monkey Bread French Toast Casserole – this easy breakfast recipe combines two favorites: baked French toast and pumpkin monkey bread! It’s the perfect easy fall brunch recipe. Are you ready for pumpkin all the things? I AM. 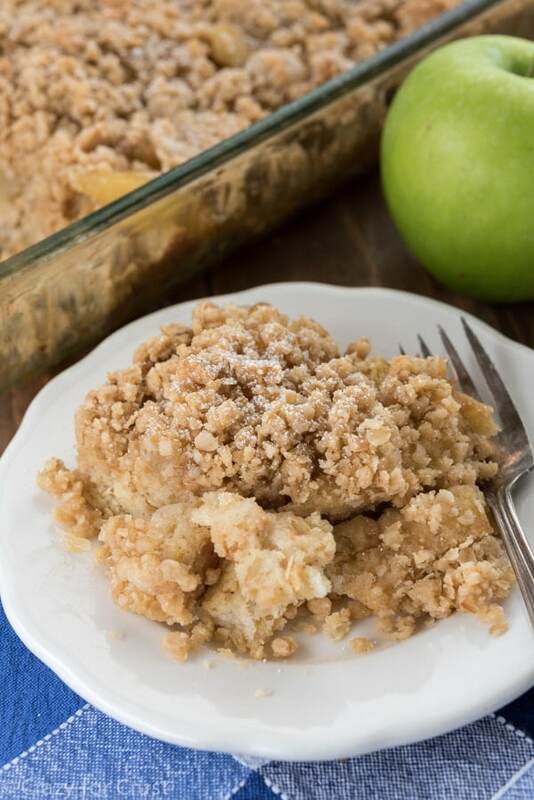 Fall is my favorite time of year; I love the flavors of apple, cinnamon, caramel, and pumpkin, the falling leaves and the new TV season, and of course, the cooler weather. Of course, we haven’t started with the cooler weather yet. It’s been 108 all week and will be over 100 for the foreseeable future. Kill me now. Please. You know what is fantastic? Having to make fall recipes when it’s 108 degrees outside and turning on my oven to bake cakes or pies or casseroles or pumpkin recipes. My A/C is getting a huge workout this month, that’s for sure (as is my pocketbook.) But I’ll take one for the team because September is tomorrow and I want all things apple and pumpkin! Every year I try and come up with an easy pumpkin recipe that will take the internet by storm. Last year it was Pumpkin Pull-Apart Bread,the year before it was my pumpkin spice snowballs, 2014 was the year of my no bake pumpkin lush. I predict this year this Pumpkin Monkey Bread French Toast is going to take the prize for most popular pumpkin dessert. What do you think? This breakfast (or dessert!) casserole is a combination of a few of my favorite things: monkey bread and French toast. In fact, I’ve made monkey bread French toast before and it was so good I wanted to do a pumpkin version using refrigerated biscuits because I had two cans that needed using up ASAP. The result? 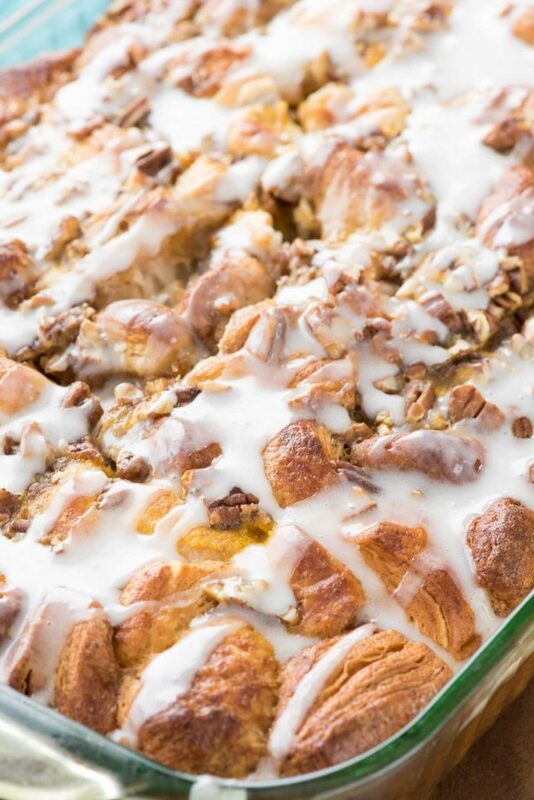 This easy, sweet but not too much so monkey bread French toast casserole perfect for fall. The casserole starts with melted butter on the bottom of the pan to create a sweet bottom layer. Canned biscuits are diced and, like with monkey bread, are shaken in a bag full of cinnamon sugar before being layered over the butter. Then, to make the French toast component, the milk, egg, and pumpkin mixture is poured over the top. But wait – there’s more. Instead of just using milk for my gooey French toast, I used one of my favorite ingredients full of fall flavor…can you guess? That’s right, Pumpkin Pie Spice Coffee Creamer is BACK on the shelves! I always buy an abundance of this and the other International Delight seasonal flavors and then need to find other ways besides coffee to use them. I’ve added the fall and winter coffee creamer flavors to cheesecake dip, pie, martinis, hot chocolate, and more. 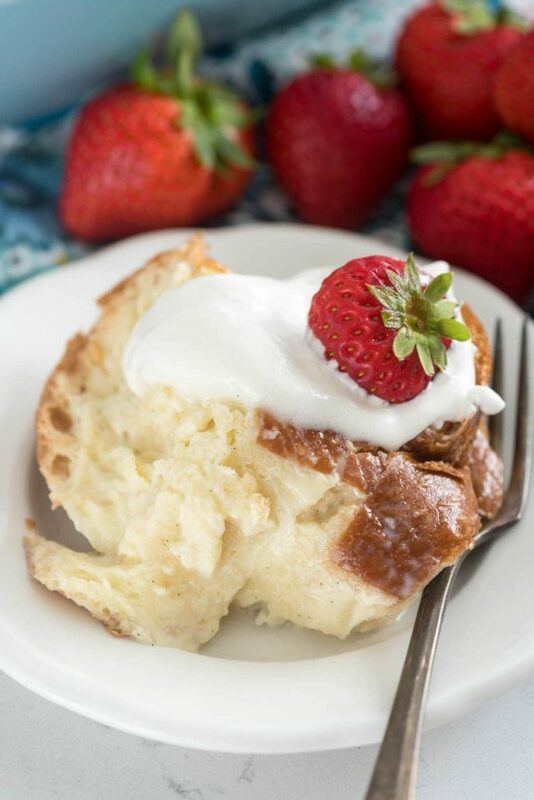 Creamer adds flavor to any recipe you put it in and it’s better in way more than just coffee! The drizzle on the top of this casserole also is filled with the International Delight Pumpkin Pie Spice Creamer. There’s a hint of fall in every bite! Bring some fall to your breakfast table…or serve it with ice cream for dessert. It’s almost like a bread pudding! Pumpkin Monkey Bread French Toast is the perfect combination of everyone’s favorite brunch recipe and is perfect for fall! Start with refrigerated biscuits. If you don’t have them, you can try slicing up pizza dough. This has not been tested with regular bread but I think it’ll work, it just takes less time to bake. 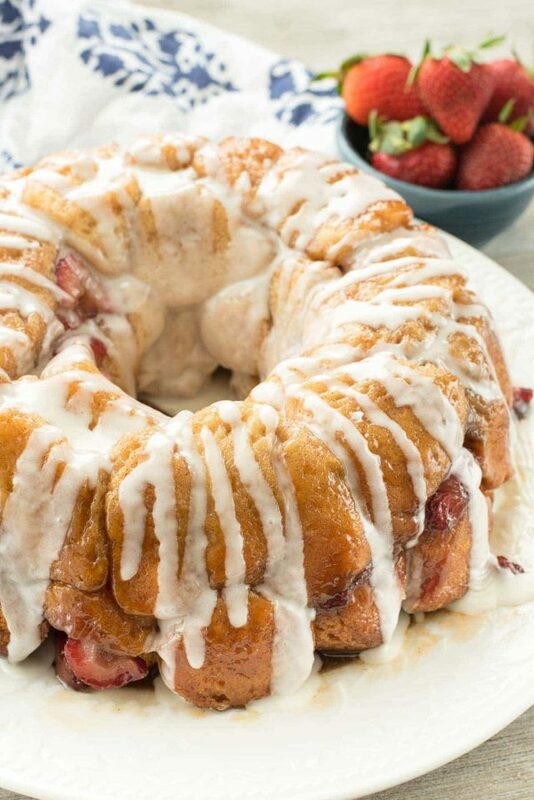 Use cinnamon rolls for an extra sweet twist! If you can’t find the pumpkin spice creamer, try the sweet cream or French vanilla and add some pumpkin pie spice to the egg mixture. Be sure to test the center when it’s done. I poked it with a knife to make sure it was cooked through. If it’s getting too brown, top it with foil the last 10-15 minutes of baking. 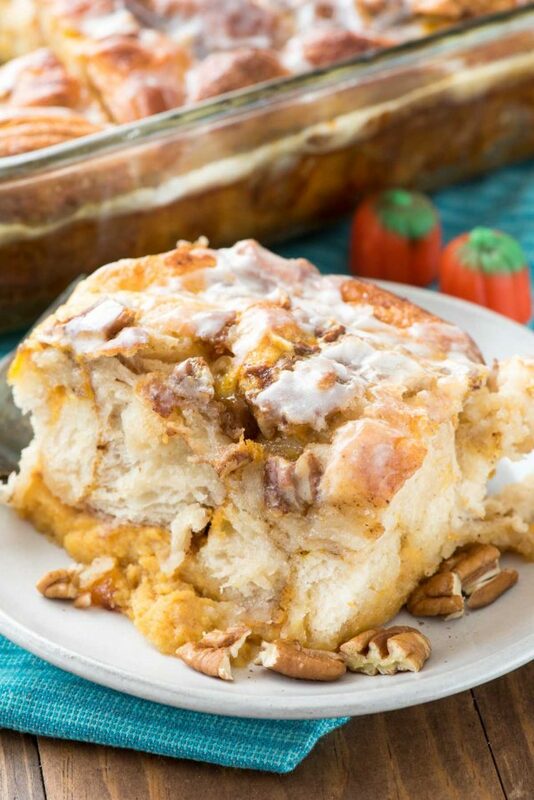 Pumpkin Monkey Bread French Toast Casserole - this easy breakfast recipe combines two favorites: baked French toast and pumpkin monkey bread! It's the perfect easy fall brunch recipe. Unroll biscuits and cut each one into 6 pieces. Place biscuits in a large gallon size bag. Stir together cinnamon and sugar and pour over biscuits. Seal back and shake to coat. Pour melted butter in the bottom of a 9x13-inch baking dish. Arrange biscuit pieces over butter in the pan. Whisk eggs and pumpkin with coffee creamer. Pour over biscuits, then sprinkle with chopped pecans. Drizzle maple syrup over the top. Bake for about 40 minutes, or until biscuits are cooked through and casserole is golden brown. Make topping: whisk powdered sugar and creamer. Drizzle over the top of casserole. Serve warm. Check out International Delight on Instagram, Twitter, or Facebook. I have made a version of this with apples and it’s crazy good. As in need to rehome it and get it out of the house good 🙂 It’s even in the 90s in San Diego 1/2 mile away from the beach. I can’t even imagine how hot it is for you! STAY COOL. Irony of ironies as I too was baking a pumpkin dessert last night with my A/C cranking! Oh honey. You have totally struck gold with this one. Cannot WAIT to try! Yes! Bring on your inspired pumpkin recipes! I’m looking forward to seeing you again in one of the supermarket checkstand magazines. Fall is my favorite season, too. You forgot to mention football and Halloween?